Back in my early days of computing carrier , all the motherboards were green in color. When other colors appeared on the motherboard , most of the brown , gray and black motherboards were cheap , good for nothing products. That set a strong believe about the greatness of green motherboards. It is not just my case . The whole computing industry guys has an affinity towards the green motherboards. .It is just a myth about the color and quality . We will look in to the basic reasons behind the color of your motherboard . The solder Mask coating is applied to the PCB to protect the copper lines from oxidization. This coating is normally green in color . Green color was long been used as the normal industry standard and continued for the computer motherboard also . Intel is one of the company which still stick on to the convention of using green solder mask for all the motherboard they are manufacturing . 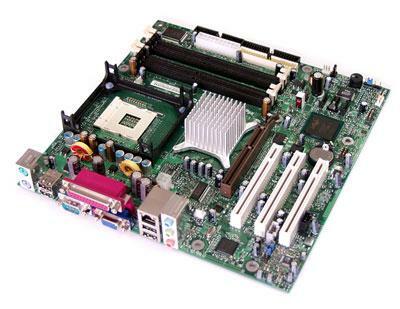 Since Intel boards were long been considered as quality range of motherboards , customers has a high affinity to green colored motherboards .This does not stop other manufactures from experimenting with their own choice of solder mask and now a days motherboards of all colors are available . So we can conclude that the colors of the motherboards does not indicate any kind of quality statements apart from the choice of solder mask color during the manufacturing process . Doubt cleared. Tanks for this post.